On Jan. 21, the Roman Catholic Church honors the virgin and martyr St. Agnes, who suffered death for her consecration to Christ. Eastern Catholics of the Byzantine tradition celebrate her feast day Jan. 14. Although the details of Agnes' life are mostly unknown, the story of her martyrdom has been passed on with reverence since the fourth century. On the feast day of the young martyr – whose name means “lamb” in Latin – the Pope traditionally blesses lambs, whose wool will be used to make the white pallium worn by archbishops. 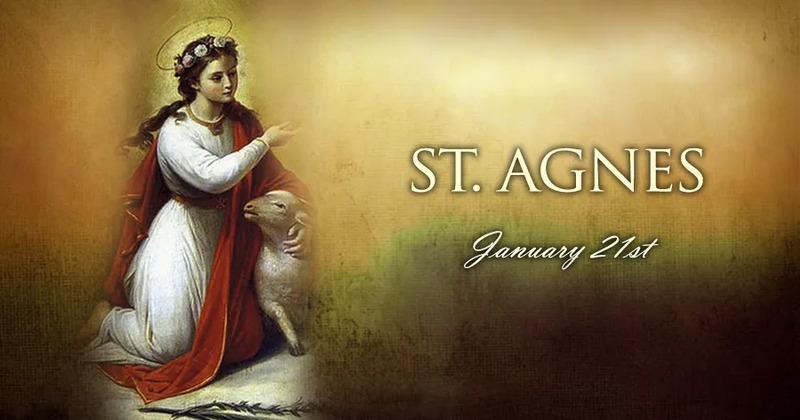 Born into a wealthy family during the last decade of the third century, Agnes lived in Rome during the last major persecution of the early Church under the Emperor Diocletian. Though he was lenient toward believers for much of his rule, Diocletian changed course in 302, resolving to wipe out the Church in the empire. Agnes came of age as the Church was beginning to suffer under a set of new laws decreed by Diocletian, and his co-ruler Galerius, in 303. The emperor and his subordinate called for churches to be destroyed and their books burned. Subsequent orders led to the imprisonment and torture of clergy and laypersons, for the sake of compelling them to worship the emperor instead of Christ. Meanwhile, Agnes had become a young woman of great beauty and charm, drawing the attention of suitors from the first ranks of the Roman aristocracy. But in keeping with the words of Christ and Saint Paul, she had already decided on a life of celibacy for the sake of God's kingdom. To all interested men, she explained that she had already promised herself to a heavenly and unseen spouse. These suitors both understood Agnes' meaning, and resented her resolution. Some of the men, possibly looking to change her mind, reported her to the state as a believer in Christ. Agnes was brought before a judge who tried first to persuade her, and then to threaten her, into renouncing her choice not to marry for the Lord's sake. When the judge showed her the various punishments he could inflict – including fire, iron hooks, or the rack that destroyed the limbs by stretching – Agnes smiled and indicated she would suffer them willingly. But she was brought before a pagan altar instead, and asked to make an act of worship in accordance with the Roman state religion. When Agnes refused, the judge ordered that she should be sent to a house of prostitution, where the virginity she had offered to God would be violated. Agnes predicted that God would not allow this to occur, and her statement proved true. The first man to approach her in the brothel was struck blind by a sudden flash of light, and others opted not to repeat his mistake. But one of the men who had at first sought to make Agnes his own, now lobbied the judge for her execution. In this respect, the suitor obtained his desire, when the public official sentenced her to die by beheading. The executioner gave her one last chance to spare her life, by renouncing her consecration to Christ – but Agnes refused, made a short prayer, and courageously submitted to death. St. Agnes, who died in 304, was venerated as a holy martyr from the fourth century onward. She is mentioned in the Latin Church's most traditional Eucharistic prayer, the Roman Canon.